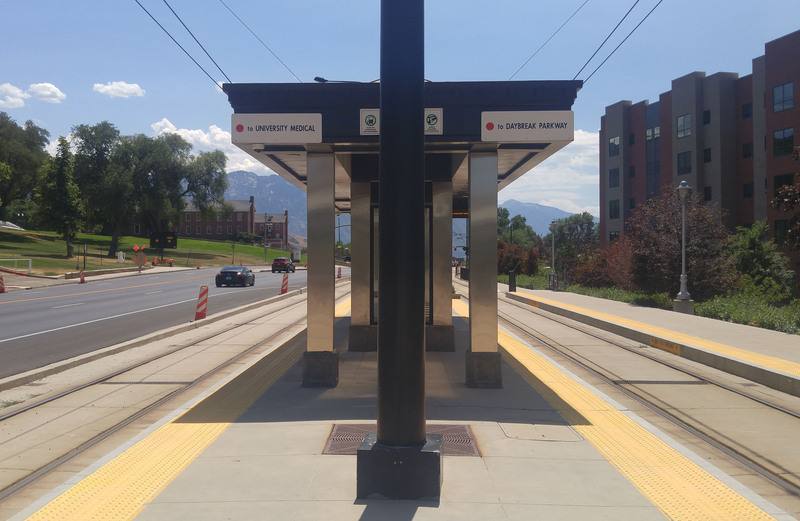 As I approach the platform of the Fort Douglas TRAX station on the University of Utah campus, my feet follow the usual routine: cutting off the sidewalk, into the grass, across a small corner of the concrete. The amount of distance this decision saves is negligible, but the worn path of half-dead grass and dirt tells me that I am not alone in repeatedly taking this shortcut. These rebel trails are “desire lines.” It seems commuting humans prefer the convenience of straight lines. I climb up the small flight of stairs, look to my left and right, and deem it acceptable to cross the railway tracks onto the flat concrete platform. I hold a secret fear that one day a shoe lace or even my entire foot will get caught and trap me in the path of an oncoming train. Before moving to Salt Lake City, I had never lived in a town with usable or convenient public transit. Because of this, using the TRAX system was somewhat of a novelty. I can usually hear the train arriving before seeing it. The overhead automated voice spills from hidden speakers to notify the other passengers and me that the train is ten, then five, then two minutes away. I visit the Fort Douglas TRAX station a few times a week when I’m heading home from class but have yet to recognize anyone else who uses this space at these times. While it seems that friends who arrive at the stop take the time to chat together, I have yet to witness or experience any type of organic community building here. It’s strange to stand or sit next to another human for five to ten minutes without saying one word to each other. 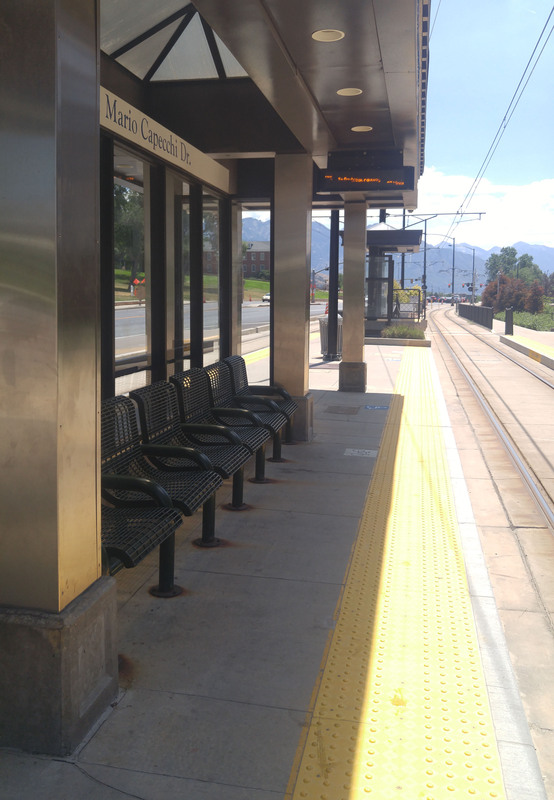 In some ways, the TRAX stop provides the perfect location to meet new people, but we instead choose to stare into our phones because the existing meaning of this space does not include community-making. The TRAX stop at Fort Douglas consists of a concrete platform a few meters wide and about a hundred meters long. Two covered bench areas are situated at either end, and a standing map of the train lines resides near the first covered benches. A tall street lamp marks a rough middle point of the platform, and its black paint blends in the night so well that I’ve nearly run into it face-first on multiple occasions. This space is not lush or green, not vast, not a space one might dwell upon or grant significance. It is hardly a space that we even conceive of as its own place. The TRAX stop itself is a mere in-between, a limbo we must temporarily occupy and move through in order to arrive somewhere else. This is a place of transition and movement, and the unspoken rules include minding your own business. I loyally abide by these rules, but this choice of silence usually serves as the loneliest, most isolating part of my day. In this isolation I am reminded of Rob Nixon’s Slow Violence and the Environmentalism of the Poor, and his question, “what are the repercussions of having mineral belongings that literally undermine a community or society’s capacity to belong?” How is my fleeting and relatively meaningless moment of loneliness a minute reflection of larger economic and social systems of dispossession at play? Could connecting ourselves to these small corners of our urban landscapes, seeing both our bodies and these spaces as connected to larger systems, help us better understand our role in something as large and daunting as, say, the fossil fuel industry? 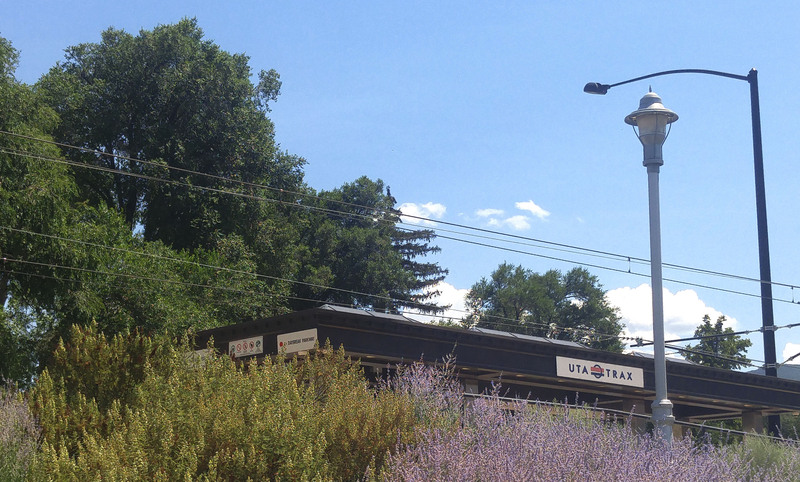 The TRAX stop is a piece, albeit small, of an urban landscape that lives and breathes. The city pulsates, and with these undulations, the trains propel down their lines from roughly 4:00 a.m. to 11:00 p.m. each day. How does this miniature hub function to bring us into this larger system, and what is its role in the steady rhythm of Salt Lake City? Can author David Haskell’s “search for the universal in the infinitesimally small” happen even in a place like this? What do we find out and what is revealed when we start paying attention to these seemingly dispensable, forgettable corners of our city? Although not physically etched like veins into the asphalt foundation of the city, we cannot forget those seemingly innocuous black wires that hang just above the surface. These lines connect the trains to the coal plants and oil refineries that twinkle, smoke, and gush all hours of the day. Catching a glimpse of one of these refineries as the sun sets is something to behold, as it sits off in the fading horizon like a miniature city of metallic beams held together by thousands of small circular lights. Usually these plants operate on the outskirts of cities, far from spaces where they could disrupt an individual’s day-to-day view or experience of their environment. They are hidden, in other words, and it is much easier to ignore these structures and their implications if we are not forced to look at them. This ignorance, however, is a privilege, as there are in fact communities, often low-income, that live in these industrial sites and do not have the option to look away. Riding this electric train does not make pollution disappear, but instead cloaks the fossil fuel industry. The exhaust is no longer coming out of my individual car, but has it simply been displaced to a coal refinery in Price that I can’t see? While in theory we can call this a “better” option of travel, we must also acknowledge it as a lesser of two evils. While standing on the platform, we can no longer afford to ignore this place. If we continue passing through this small piece of the world blindly, soon our shoelace will catch in the tracks, and by the time we look up, it may be too late. The bright, glistening train runs an average of twenty-five miles per hour, but mindlessly waiting at this TRAX stop feels like a form of slow, hidden violence. Soon I will hear that familiar sounds of scraping metal and the engine’s chugging and whining as it rounds the corner of Mario Capecchi Drive. When the train arrives, everyone will stand and try to position their bodies in a guess of where the doors will land beside the platform. When the doors open, a few people will trickle off, and there will be a strange dance between them and those of us rushing to board and grab a seat. We will find our places on the train, then continue to pretend that the person next to us, with whom we just stood next to for ten minutes at the stop, does not exist. Favero, Elissa. “Mapping Desire Lines: From Richard Long’s Walks to the Sinewy Paths of Smell.” Arcade, 2014. Haskell, David. The Forest Unseen: A Year’s Watch in Nature. New York, NY: Penguin Books, 2010. Relph, Edward. 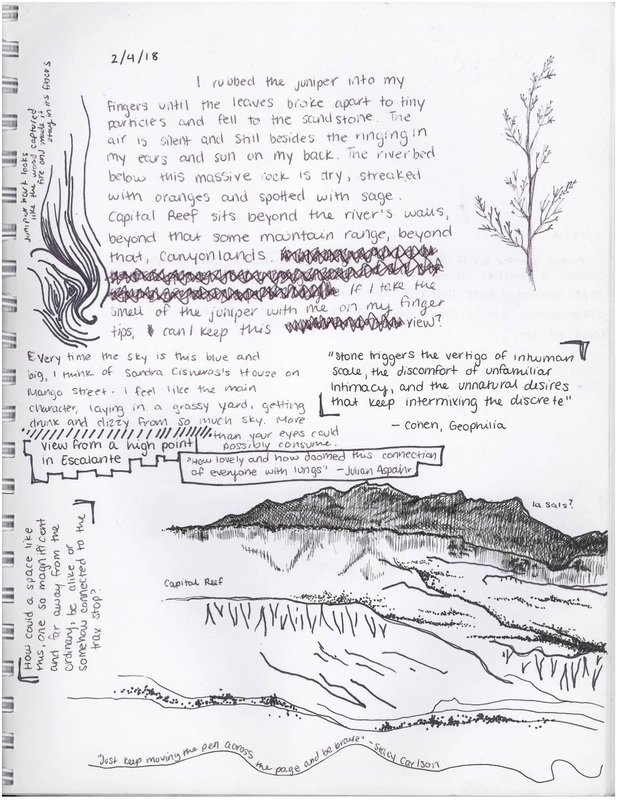 “Sense of Place.” Ten Geographic Ideas That Changed the World, ed. Susan Hanson. New Brunswick, NJ: Rutgers University Press, 1997. Tuan, Yi-Fu. Space and Place: The Perspective of Experience. Minneapolis, MN: University of Minnesota Press, 1977.